A coffee shop with art displays on Tower Bridge Road in Bermondsey. It opened in January 2004. It changed ownership in December 2010 according to a thread on the SE1 website. Our reviews date from the time of the previous owner. The shape is long and narrow, and it only seats about 20 or so people inside, on a combination of orangey-red plastic chairs and hard banquettes (with loose cushions). There's a garden/smoking area out the back too, with tables and chairs and a toilet. The SoBo website describes it as an "art gallery espresso bar", and it does indeed have displays of art for sale on the walls — these appear to change every so often. LondonSE1 says it has BT Openzone wifi. They have a small range of hot and cold drinks (less than you would expect from somewhere like Caffe Nero) for takeaway or eat in. secretlondon noted in September 2008 that they offer soya milk for these. They do some food including cakes and panini — the panini are pre-made and displayed at the counter. Takeaway is a little bit cheaper. They have a breakfast menu too. They're licensed, and serve wine at least, possibly other bottled alcoholic drinks too. There's no table service — order and pay at the counter, and they'll bring your food over to you when it's ready. secretlondon visited a couple of times in September 2008. On my first visit, I arrived at 3:30pm and there was only one other person in there. There was some background music. I had a chai latte photo and a spinach pastry photo. My pastry came with a small side salad and the latte and pastry cost £5.20. On my second visit there were pushchairs and children playing with a toy box at the entrance, which felt a bit East Dulwich like for my taste. This time I had a takeaway spinach pasty which was served in a see through plastic box with a dressed salad. Kake visited on a Tuesday afternoon in July 2010, also arriving around 3:30pm — there were about half a dozen other customers during my visit. Music was playing, but only just audible over the noise of the road outside. I tried the parma ham panini (£4 for eat-in). The SoBo website claims the panini are toasted, but mine was actually microwaved (although competently enough). The bread was a bit dry and nothing special, and I could have done without the random and somewhat ugly-looking splodge of olive oil that they put on top. The filling was fine. A couple of rather tough-skinned cherry tomatoes were supplied on the side. My tea (£1.75 for a two-cup pot) was fine; I asked for it to be "very weak", and they got it just right. I wish they'd offered me soya milk, though — I much prefer it, but didn't realise until later that it was an option. Accessibility: Small ridge at the entrance. One step down to the garden area and toilet. 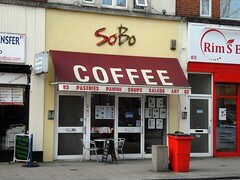 secretlondon's verdict: Their coffee is nice and available with syrup and soya milk. They are notably expensive for the area though. Kake's verdict: My panini was disappointing, but I might pop in again for a cup of tea (which given the size of the pot I felt was a reasonable price). Last visited by Kake, July 2010. Mon-Sat opening hours taken from a sign on that visit. Sunday hours taken from a January 2011 post by the new owner on the LondonSE1 forum. Last edited 2019-02-01 16:08:29 (version 16; diff). List all versions. Page last edited 2019-02-01 16:08:29 (version 16).